I've made it pretty clear this past year or so that I love the band Waterparks. I've seen them a bunch of times opening for All Time Low, at Slam Dunk, and on their headline shows. So when they announced their first UK headlining tour, I was there. I managed to make it to three of their shows on the tour: London, Birmingham, and Brighton. The first night I went to was in London at the Underworld in Camden. The venue is super tiny and is basically in the basement of the pub The World's End. The stage is in the corner of the room and there are several pillars in the middle of the standing area in front of the stage that block parts of the stage. The capacity was 500 and I was surprised it was even that much, it seemed more like 350-400 capacity place but there is a second level that you can also watch from. The night started off very sweaty and as you can imagine, only got worse as the night went on. The first act was an unsigned band from London called The Bottom Line and I can honestly say they were one of my favorite opening bands I've seen this year. They were so engaging with the crowd and even though no one knew the words to their songs, they had the entire place jumping up and down and getting hyped up for the rest of the show. They were the essence of pure pop punk and I definitely recommend checking them out. 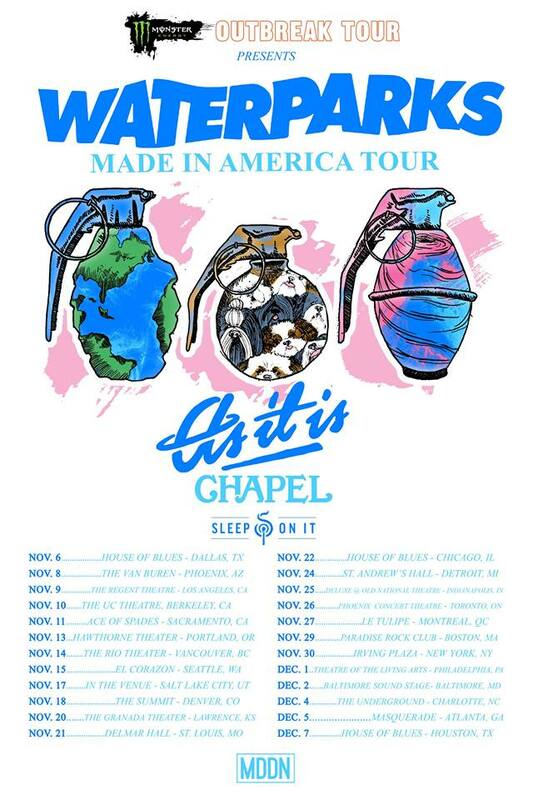 Next up was a band from the US that Waterparks toured with in the Spring, Chapel. Chapel is a really cool emerging band that I am really excited about. They are managed by Tyler Carter of Issues and the manager of Crown The Empire. They label themselves as indie/pop and definitely have a twenty one pilots vibe mixed with some electro-pop. They only have three songs released so far, but they played some new ones on the tour and I definitely think they are ones to watch. Finally the headlining band Waterparks were on next. If you know anything about the band members, you'll know Awsten is a bit of a wild card. He's a bit quirky but in a super endearing way and in the most Awsten way possible, the final song played before the band entered the stage was High School Musical's Breaking Free. With most of their fans being 16-early 20s it definitely got the crowd singing and nostalgic. The band came out to the instrumental part in Plum Island and the crowd was ecstatic. It was a high energy show from beginning to end and a lot of crowd interaction from the band. Awsten even allowed anyone to throw anything they wanted on stage, which included a bunch of lemons and a miniature cardboard cut out of himself. Toward the middle of the show I could feel a little lull in the crowd which didn't seem to have anything to do with the setlist or band's energy but due to the fact it was sweltering hot in that basement. Everyone had been jumping around and having such a good time that after a couple of hours of that in a super packed basement, it gets tough. However that didn't stop the band from playing one of the more energetic songs Mad All the Time and Awsten telling the crowd to form a mosh pit. The crowd obliged and the energy kicked back up for the last couple of songs. I had never seen the band play Silver before so I was really excited that it was on the setlist for their UK shows since its one of their oldest songs and don't normally play it. After Silver they ended with one of their recent singles, Royal. They left the stage for a couple minutes and Awsten came back out with an acoustic guitar for the encore. The band ended the show with 21 Questions starting off with just Awsten and the guitar and ending with the whole band, similar to the recording. Once the show ended, we decided to stay out back and meet up with the guys. Geoff came out fairly soon after the show ended and met a good 50 people before he had to leave. I was able to talk to him for a while and get a quick picture. A while later my friends had to leave but I stayed about 20 more minutes before deciding to leave myself. I said bye to some of the people I had been waiting with and made my way to home when I turned the corner and completely walked into Awsten who was walking alongside Geoff from the front of the building. Otto came out shortly after and I got to have a conversation with Awsten and a short hello to Otto. The next day I travelled to Birmingham to catch Waterparks headline their biggest international headliner at the O2 Academy Birmingham! Waterparks played the O2 Academy 2 Birmingham on Friday, September 29th to a sold out show of over 600 people. To date, this was Waterparks biggest headliner they have ever played outside of the US. This was very exciting to be a part of and was a great show overall! The Bottom Line and Chapel both had great sets once again and made the show that much better. Luckily the venue had much better air conditioning and security giving out water that made the show much more enjoyable than the night before in London. Waterparks had high energy from the moment they stepped on stage to Plum Island all the way to the end of 21 Questions. I had to leave soon after the show ended to hop on a train back to London so I wasn't able to wait to talk to the boys after the Birmingham show. The day after and the final date on the UK leg of the tour was on September 30th in Brighton. The show was in a small club, called The Haunt, and was right near the Brighton pier and was only 350 capacity venue, which was the smallest I have ever seen Waterparks play. There was no barricade so you can imagine how much of the show went. The doors opened an hour later than the last two shows, which normally would not bother me at all, but with the rainy/windy British weather and being on the coast, it was not a fun last couple of hours waiting in the cold and rain. Although the doors opened an hour later, the first band only came on about 10-15 minutes later than they did at the other shows, so it was very rushed getting each band onto the stage. The Bottom Line crushed it once again and the lead singer managed to crowd surf again, even in that tiny venue. A lot of people got crushed but it was still pretty fun. Chapel came on shortly after and I was really bummed that it was the last time I would be seeing them for a while. I really hope they are planning on releasing an album or EP very soon. Waterparks came on and put on a great last UK headliner. Although it was tough at times with no barricade or security to help give out water or help crowd surfers out of the pit, the band put on another high energy show with lots of banter with the crowd to make it stand out. After the show ended, a bunch of us stayed after to talk to the band. Unfortunately, the rain and wind had not subsided while we were inside, and had actually gotten a bit worse as the night went on. We decided to wait out back because we thought that would be the best bet to see them and it was also blocking us from the awful winds coming off the coast in the front of the building. After a while, Geoff came outside and started talking to some people near us but security made him go to the front of the venue instead. At the front of the venue, there were at least 150 people waiting and some harsh winds. Geoff was such a trooper and a nice guy, he stood outside in the rain and wind and tried to talk to and take pictures with just about everyone. They even made him move across the street near a bus stop at one point where he was getting drenched. I know it meant a lot to the people he was meeting that he stood outside for so long and in the terrible weather. After that, we went back to the back of the building to get away from all the rain/wind and ended up talking to Awsten and Otto as they were putting things in their bus. They were both a little sick so we didn't stay too long but it was great to see them and say bye as they were leaving for their tour in Germany next. I definitely recommend checking them out on their US fall tour if you can!